A family camp in a safe and encouraging environment for mums, dads, grandparents, and children! Shifa Institute is dedicated to bringing families together in a positive and encouraging environment. 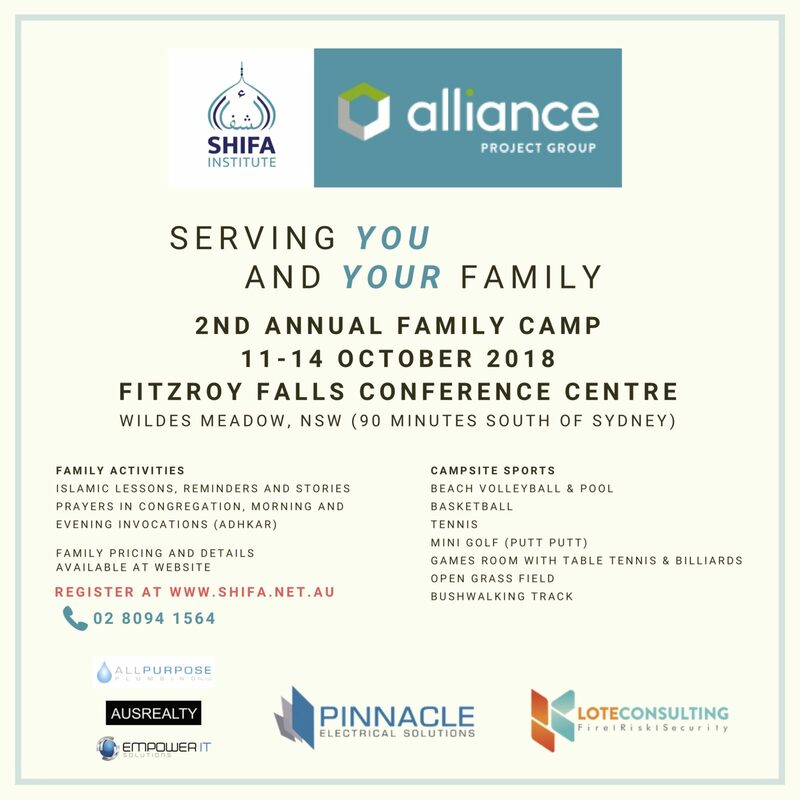 As part of our programs, we would like to invite you to apply to attend our 2nd Annual Family Camp over 4 days and 3 nights, from the 11th to 14th October 2018. Fill in the registration form and follow the instructions below to secure your place! Registrations are NOW OPEN. You must submit an application form, and pay a $200 deposit for your family. Your application submission and deposit payment does not necessarily guarantee your family a place on camp. Shifa Institute reserves the right to reject any applicant, whether or not there is a vacant space. If your application is not accepted, the deposit will be refunded. The majority of rooms have internal ensuite bathrooms. However, there will be up to 4 rooms having shared bathroom facilities. For some of these 4 rooms, the bathrooms will be in a nearby separate male/female amenities block. Shifa Institute reserves the right to allocate families’ rooms based on practical needs. Each application will receive an email confirming receipt of your submission. Once received, you will need to pay the deposit of $200 according to the Shifa Institute bank details in the confirmation email. Any application received without an accompanying deposit may not be considered. Applications will be assessed, and a confirmation of your family’s place will be sent by 30 September 2018. Once your family’s place is confirmed, the balance will need to be paid by 6 October 2018. If the balance is not paid, your family’s place on camp may be forfeited and offered to another family. In the case that your family can no longer attend for any reason, you must advise us immediately so that your place can be offered to someone else. In this situation, an administration fee will be withheld from the deposit.